My county library system offers Overdrive for residents of the county. You just need your library card number to sign up and there is no charge. Also, most libraries in the U.S. have interlibrary loan and they will perform a search all over the country if they don't have a book in their system, again just for being a resident in the county. I have received books on loan from libraries in many other states this way. It would be beneficial to visit one's local library and website and just see what options are available. You may be surprised just how much is there. And also remember to support the local libraries who offer all of these things, if not with money but also with voting power. Many are public and taxpayer-funded and are in a constant battle against those who slash their funding and attempt (sometimes successfully) to shut them down. Firesloth, I am totally with you. I love books; the baking vanilla smell of the paper, the dry-leaf rustle of high-clay pages turning, the solid feel of the book in my hand. But... I love reading more. I'm still absolutely thrilled every time I pick up my Kindle that I have hundreds of books right there, weighing less than half a pound. And I can download more, even buy new ones, wherever I go! I still buy books. Mostly high-quality graphic novels or collections. But nothing beats the Kindle for convenience and even for the reading experience. For every time you are sipping a drink in a soft chair with a hardback in your living room, there are dozens of subway trips, waiting in the car, or riding squished in a plane where that same hardback would be a totally different experience. Kindle for me. As for Kindle v. paper books: I can't go back. When you're reading in bed, you have to have a separate light to wrangle and keep lined up, the pages fall closed / open...I would always choose to read a book on Kindle over reading a real book these days! And don't get me started on trying to travel with a book in your carry-on. That's why I started with a Kindle: I was trying to read one of the Game of Thrones books, but I was near the end, so I was packing two of them in my bag. Or trying. The Kindle has made me read a lot more on planes, rather than spending that time watching movies. It just makes me so happy thinking about it even a year later. "Black Leopard, Red Wolf" is an amazing ride. Huge sale at Audible right now on 'first books' in series - if anyone's interested in Terry Pratchett, they're counting most of the sub-series book ones as their own things. You can also pay for access to some of the bigger libraries if yours doesn't have good options. I think Brooklyn lets you pay $50/year, and they've got a great Overdrive catalogue. Whoa, I had no idea! I was begging for something like this when we were in Chile. Our little library is great and served us well, but there were a few books here and there that they didn't have. For one year I would have gone for that. Goodreads has a good thread on Overdrive libraries with good collections that you can pay for access to. Different libraries have different availability by what they pay for. I have access to two libraries with significantly different catalogs (same for Hoopla). Also don't forget, most libraries allow you to search for books they don't have the license to and give the option to "Recommend" a title for pickup. Some are responsive to requests, some aren't at all. So YMMV. Kindle Unlimited, 3 months for $.99. Generally work as long as you don't have an active subscription. Firesloth, I am totally with you. I love books; the baking vanilla smell of the paper, the dry-leaf rustle of high-clay pages turning, the solid feel of the book in my hand. But... I love reading more. I'm still absolutely thrilled every time I pick up my Kindle that I have hundreds of books right there, weighing less than half a pound. And I can download more, even buy new ones, wherever I go! We downloaded dozens of books from our Indiana library while we lived in Chile for a year. Not only that, but when my son got upset because he had finished a book in a series and wanted to read the next, I downloaded it for him immediately...while we were on a train traveling between Malmö and Stockholm, Sweden! To go along with your Overdrive library subscription(s), if you use Chrome as your browser, you may find the Library Extension useful. 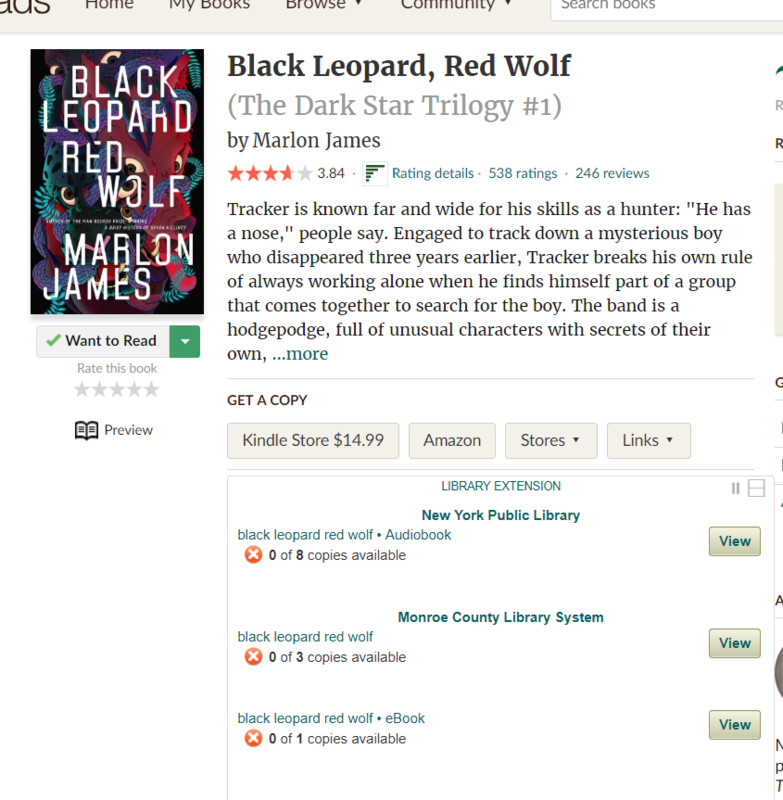 You configure it with your libraries, and then whenever you go to a book website (like Goodreads, or Amazon), it inserts a direct link to borrow the book from your library. It's not always 100% accurate, but it's very useful if you like to borrow a lot of your books. Leon, an itinerant tradesman with a checkered past, is perplexed when he is saddled with responsibility for a perky 12 year old, Mathilde. As he becomes entangled in business opportunities and engages with figures from his past, Mathilde's willfulness alternately vexes and endears her to him. Will his unwilling loyalty to her end up damaging his career? And can he give her the education he knows she needs to get ahead in life?" I mean, seriously? Poke your nose into the book for two pages and you'll laugh hysterically at the idea that Tracker could be described that way. Here's the start of the novel, with Tracker speaking. The child is dead. There is nothing left to know. I hear there is a queen in the south who kills the man who brings her bad news. So when I give word of the boy's death, do I write my own death with it? Truth eats lies just as the crocodile eats the moon, and yet my witness is the same today as it will be tomorrow. No, I did not kill him. Though I may have wanted him dead. Craved for it the way a glutton craves goat flesh. Oh, to draw a bow and fire it through his black heart and watch it explode black blood, and to watch his eyes for when they stop blinking, when they look but stop seeing, and to listen for his voice croaking and his hear his chest heave in a death rattle saying, Look, my wretched spirit leaves this most wretched of bodies, and to smile at such tidings and dance at such loss. Yes, I glut at the conceit of it. But no, I did not kill him. Bi oju ir enu a pamo. Not everything the eye sees should be spoken by the mouth. This cell is larger than the one before. I smell the dried blood of executed men; I hear their ghosts still screaming. Your bread carries weevils, and your water carries the piss of ten and two guards and the goat they f*ck for sport. Shall I give you a story? That's the real deal, right there, that's mainlining the new standard for fantasy. Marlon James has done it again. The book I'm actually reading right now has taken a turn. It might actually be horror. That sounds familiar... What is it? Sorry, I should have told you what the book is! It's Mr. Penumbra's 24-Hour Bookstore by Robin Sloan. I haven't gotten very far in, but so far I'd categorize it as post-boom San Francisco hipster mashed up with a bit of magic realism. But I'm only about 30 pages in, so the "real story" hasn't quite started to unfold yet. Ah, no wonder. You’re in for a great read. Just wondering, another San Francisco book... Have you read “Sourdough” yet? I read that right after Mr. Penumbra, and it’s another fantastic outing for our Mr. Sloan. Escape Pod did an nice audio version of that a number of years ago. I converted it from a podcast to an audio book so I can listen to it whenever. I loved Mr. Penumbra. Sourdough I liked a lot, but boy it felt so similar. For me reading those books, I felt a constant sense of "cheeriness," even when things weren't going as well for the protagonists. Sourdough avoids some of the weaknesses of Mr Penumbra, particularly some of the clumsy unintentional sexism. I thought it was a much better book. I very soon completed my first group of ten backlog books after my last update because the last "book," Tomfoolery, turned out to be a short story instead of a book. So very annoying in one sense because I like my books to be *books* but it's still one less in the backlog so that's a good thing! I'm also now 73% through Dostoevsky's, The Idiot, in the midst of all the backlogging! There's a bit of plagiarism going on with a Kindle Unlimited author. Courtney Milan found it first and its involving other authors. The thief claimed it was the fault of her ghostwriters. Milan's blog has info as does Nora Roberts. If there are books by authors you enjoy with KU, great! But do be aware that the way Amazon pays the authors who do KU is by the page view and there are some issues with it. Odd, I would have never expected that a KU author would have ghostwriters, but shows how much I know about writing I suppose. If you like time travel stories, you should read “Replay” by Ken Grimwood. It’s basically the blueprint for Groundhog Day and - to an even larger extent - The First Fifteen Lives of Harry August. Compared to the latter, it’s a more accomplished novel with a more satisfying message and conclusion. It has just been re-released as an ebook in English, before that it had only been available as a German version in my region, as far as I know, so I guess it might not have been accessible as an ebook in English speaking countries either? I would say this is easily my new favourite book. I really enjoyed it and have flung myself eyes first into Book 2. The detail, characters, story, everything just feels delightful to read. The progression of characters and the pacing feels on point. 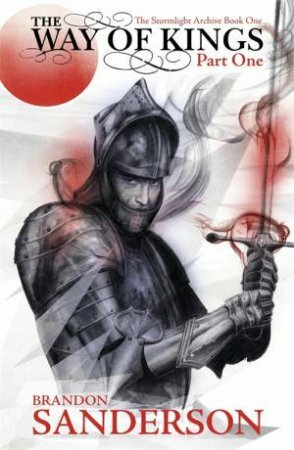 I find that Pacing is one of the hardest things to get right in a story and Brandon Sanderson does it really well in this one. The world feels alive and interesting. There are little pieces that just draw you in and you want to know more. Highly recommend it. Easily 5 stars and like I said before, my new favourite book. How would that work? You would think this is an area that Amazon can easily police since it is just text matching, or is it more like they copied sections but changed names and synonyms? My 13yo daughter (who is a voracious reader) has just finished a bunch of Sarah J Maas and Grishaverse books and is about to start Warbreaker. I'm interested to see whether she'll get on with them or not. I've just finished Children of Time by Adrian Tchaikovsky, which was really excellent. Just finished this myself. Loved it. Will be diving into book 2 shortly. I have a new favorite author, I guess. Sorry Mr Banks, but it was probably time the torch gets passed. Which is to say that I finished The Broken Earth trilogy last week. And holy f*ck, that's so good. Had to sit quietly for a little while after turning the last page and think about what I'd just read. I was processing with my girlfriend afterwards (she's a massive fan), and remarking on how surprising it was walking out of a fantasy thinking about generational trauma, bigotry, bureaucracy, love, hopelessness and grief, and the intersectionality of all of them. Like, when did it happen that that was feasible? Instead of just having some hobbits stab some orcs and calling it good? Where should I go next in Jemesin's work? Side note - I've been hanging onto Iain Banks' last novel since he died. It's the only one of his books that I haven't yet read, and I was saving it for some time when I needed it. As I walked away from the Broken Earth, wondering how the hell I'd follow that, and oddly lamenting the passing of the favorite author torch, I suddenly realized that this is the perfect time. The Quarry is up next. If you go over to the blog post with examples, you'll see it's more like the latter. Also Amazon isn't incentivized to police plagiarism. They make money either way and no major publisher that could actually impact their bottom line is having the issue. Exactly what I wanted to hear. Into book 2 already and not disappointed.